“The skincare market is growing year after year. We see more and more skincare procedures, products and brands becoming available to us, and we are under constant pressure to look younger than we are. Where does it stop? And what does the future look like for skin? Bernadette Wegenstein, in her book Getting under the Skin: Body and Media Theory, puts it like this, ‘In cosmetics, just as in the figurative arts, the skin has become a detached commodity. Marketers think about it in absolute, abstract and detached terms.’ Our own skin has become a material ans surface which is open to creative reworking. As with mass-produced commodity products, skin is a means for individual expression- we want to be different and set ourselves apart from the masses. Just as we can define ourselves through the brands of clothing we wear, or the brand of mobile phone we have, we can now define ourselves by the brand of skincare product we use. If you are using skincare by Chanel, you want people to know that your skin is by Chanel, in the same way that Chanel handbags have clear branding, why shouldn’t our skin. 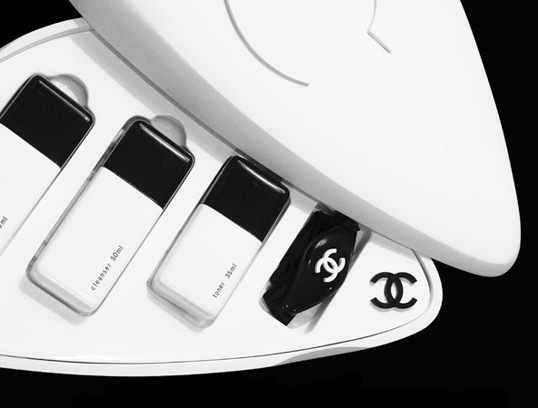 Considering this idea of branding skin, I have designed a beauty kit for Chanel. I chose Chanel due to it’s strong logo and brand history, and the fact that it is a high end brand. 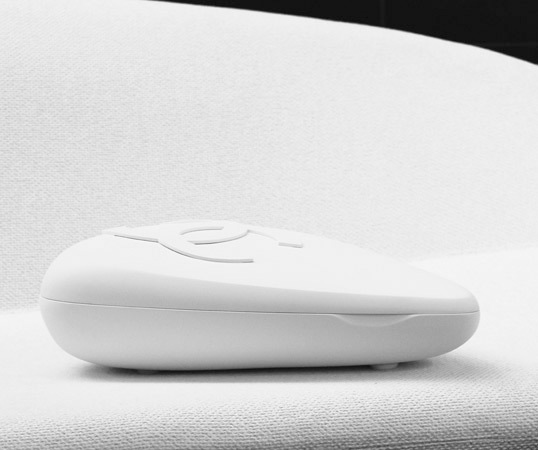 The packaging is manufactured in Corian, giving a smooth finish, and the organic and pebble like form is intended to reflect our obsession with perfection, especially when it comes to our faces. The kit is used at night before sleeping and includes a Cleanser, Toner and Moisturiser. There is also a headband in the kit, which is tied around the head and worn while sleeping. 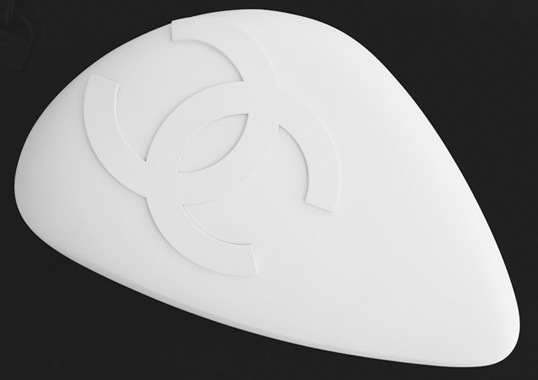 There is a silicone ‘Chanel logo’ on the underside of the headband which during the night leaves an imprint of the Chanel logo on the skin, which is visible for a few hours. People can then clearly see that the owner uses Chanel Skincare and not some other brand. 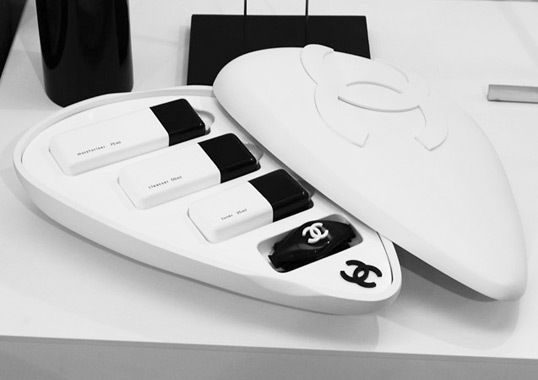 Their skin has been branded Chanel… the ultimate fashion accessory you might say!?? Unless, and I mean this fully, this student piece is a biting commentary on the asinine status values dominating the current Western culture, then it is without a doubt the most fatuous and hollow example of man’s idiocy. I am next expecting to see a label hound decked out in expensive designer initials all over every piece of clothing they have on, Swarovski crystals stuck into front gold teeth. How about Amani logo contact lenses?! Good god. We’re all doomed. Shelley, Yes, it is a commentary on our culture and the values we put on beauty and fashion. The purpose of design is often to predict in a very extreme way what future trends might be and through the process of thought perhaps start trends. Just as art should not to be taken at face value, design has much research and direction behind it that gives it its wings to make it to a final, developed concept. Having studied with Ryan myself I know the basis of his project was studying the obsession with preventing aging/being young forever in our culture– skincare is the most obvious area that can be seen. Brands do play an integral part in our lives, and as much as we decide to continue to wear branded t-shirts and hand bags, I see no reason why we should stop before contacts or skincare. Do you? I wondered that too Shelley. Not at all to agree with it, but when you think about it, it is such a reflection of how we exhibit ourselves. I mean we really are just a walking brand that it almost is us. But yes, lets hope she is doing it as a wake up call to our consumption. I think some people are missing the point here, I’m sure Ryan isn’t trying to turn us all into label whores! I think this is a beautiful piece of packaging and to be produced by a student is outstanding. Keep up the good work, don’t let the minority get you down. Daniel–agreed…I think people are looking at this a little too seriously. I think it’s not only beautifully designed, but y’know, it’s freaking hilarious! It’s nice to see witticism alongside refined design. this is genius idea! Very creative! 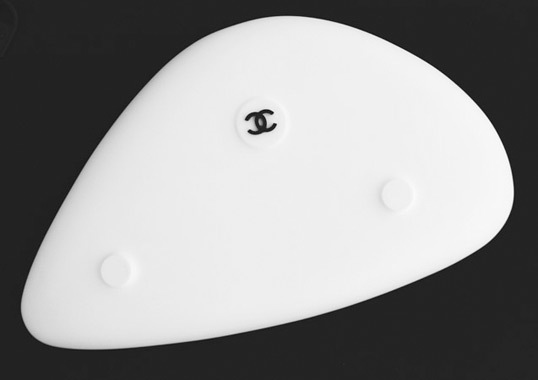 Chanel should buy this idea from you…although it’s kinda a sarcastic product! inspired by Barton’s comment it started making me think about how we continuously strive to send people messages about our personality, employability, likability etc without conversing in actual conversation with another human being, maybe this is just the effects of the digital age. However, maybe this piece of design is the start of a whole new way of communication, maybe the items we wear will become a means of visual speech with coherent and logical laws on which the user follows. This is ART…and I think she did a terrific job. From concept to desing, it is perfect. I think your work brings out your concept. From the packaging point of view, i don’t think i would be impressed. I think you’ve tried to squeeze in the logo, any space you found. No offense, just judging as a consumer. Intentional or not, this concept puts a smile on my face. Of course it’s not everyone’s idea of chic but importantly it feeds ideas, so when I see great work like this I save it to my scrapbook in the knowledge that at it’s core the idea will transfer to something practical. In reply to the initial negative response; indeed it’s true, we’ve become increasingly obsessed with brands but this isn’t a recent phenomenon as such. Ever since we set foot on the planet we’ve strived to identify ourselves and where our allegiances lie, think about the Maoris or Aboriginies, it’s a tribal thing! Fortunately we’re all different and so for that reason I shall now press my head against the Apple logo that’s straring me in the face!